Austenitic cast irons are classified as a range of high-alloy materials with austenitic matrix, containing nickel, manganese and partly also copper and chromium for stabilization of the austenitic matrix. Carbon is contained in the material in the form of graphite flakes or graphite nodules. Formation of austenite takes place due to the impact of specific alloy elements, predominantly nickel, which decrease the eutectoid decomposition temperature of austenite to below room temperature. Materials with nickel contents of 15 to 36 % are also grouped by the designation Ni-Resist. The properties of austenitic cast iron materials depend on the respective structure and mechanical properties suitable for the required application cases. These properties depend on the composition of the iron, the respective type and the production process applied. 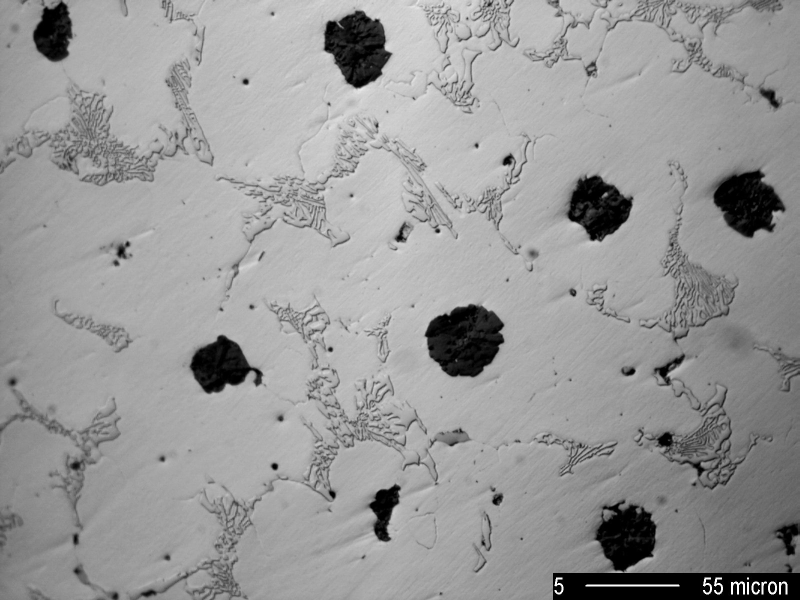 Figures 1 to 3 show pictures of different structures of nodular graphite cast iron. With higher chromium contents, carbide is increasingly, discharged. However, the ratio of graphite content to carbide content may differ greatly in cast iron production. Austenitic nodular graphite cast iron is standardized to DIN EN 13835. This European Standard approaches the classification of various types of cast iron, which are mainly used based on their properties with regard to heat and corrosion resistance. Typical applications for the various types and classes are contained in Annex A of DIN EN 13835. Today, austenitic cast iron is almost exclusively melted in electric furnaces (inductive furnace or electric arc furnace). Alloying is performed in the furnace. Magnesium treatment, as well as primary and secondary inoculation, is performed in accordance with conventional procedures. It must be taken into account that, as a general rule, molten metal with high nickel contents is more prone to gas absorption in the furnace, in particular at high temperatures. As a consequence of this phenomenon, austenitic cast iron must be melted and cast as quickly as possible. 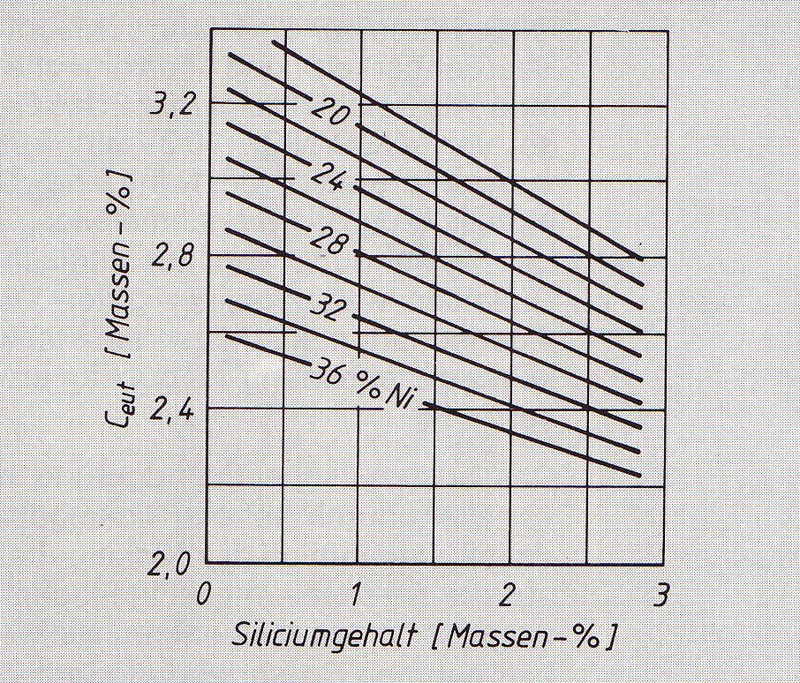 In general, the casting temperatures are higher than for conventional GJS (up to 1500°C, depending on wall thickness). For monitoring of homogeneity of the molten metal, application of the thermal analysis method is recommended. In any case, the casting temperature of every bath of molten metal must be checked using a thermoelectric couple. In addition to the special melting process, perfect molding methods are a prerequisite for fault-free castings made of austenitic cast iron. Green sand and dry sand molds are used for these purposes in similar ways as for unalloyed nodular graphite cast iron. Particular emphasis must be placed on the pre-eminent importance of mold strength. The higher the mold hardness, the greater the tightness of castings. Dried or chemically hardened molds are the best to meet the conditions for rigid molds. Since austenitic cast iron does not transform during cooling, the castings can be removed from the mold directly after solidification. The same holds true for heat up and cooling; and, hardening and tempering as with other cast materials is not possible, either. However, stress relief by heat treatment and spheroidizing annealing for distribution of the carbides and for reduction of hardness are state of the art. With regard to some aspects of shrinkage, austenitic cast iron displays equal properties as cast high-alloy special steel. Shrinkage rates of approx. 1.6 to 1.8 % are taken into account; in some cases and with unrestricted shrinkage, rates of up to 2.2 % are possible. For this reason, special patterns will be required in most cases of manufacturing of castings from austenitic nodular graphite cast iron. The used cores must provide very good disintegration properties so that they do not represent an obstacle to shrinkage and that cracking and tearing of the castings is prevented. 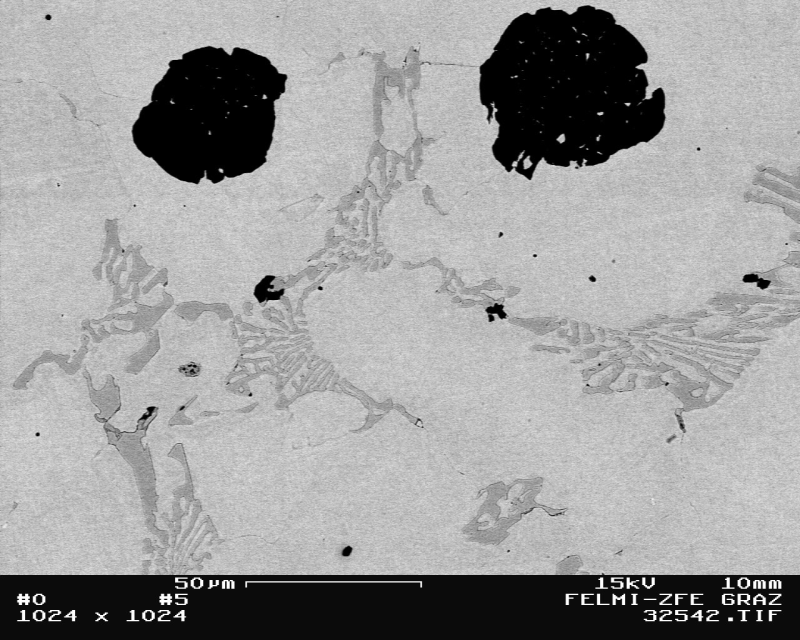 In addition, austenitic nodular graphite cast iron requires significantly larger feeders compared to unalloyed GJS, which ultimately has an impact on the gating system. As a rule of thumb, it can be presumed that the cross section of the gates must be around 50 % larger than for unalloyed GJS. The concentration rate of austenite formers must not fall below the lower limit, especially in low-alloy types, since this may lead to martensite formation (higher hardness, poor machining properties, ferromagnetism) under conditions below room temperature or after cold hardening (mechanical processing). In order to prevent chill, sufficient inoculation must be ensured. The austenitic matrix is achieved by addition of nickel, manganese, copper and chromium. Larger additions of chromium increase strength, hardness and scaling resistance of the material, suitability for welding is improved and the coefficient for linear expansion is reduced. With thick-walled castings, the proportion of austenite-stabilizing elements should not be around the lower limit due to slow cooling. 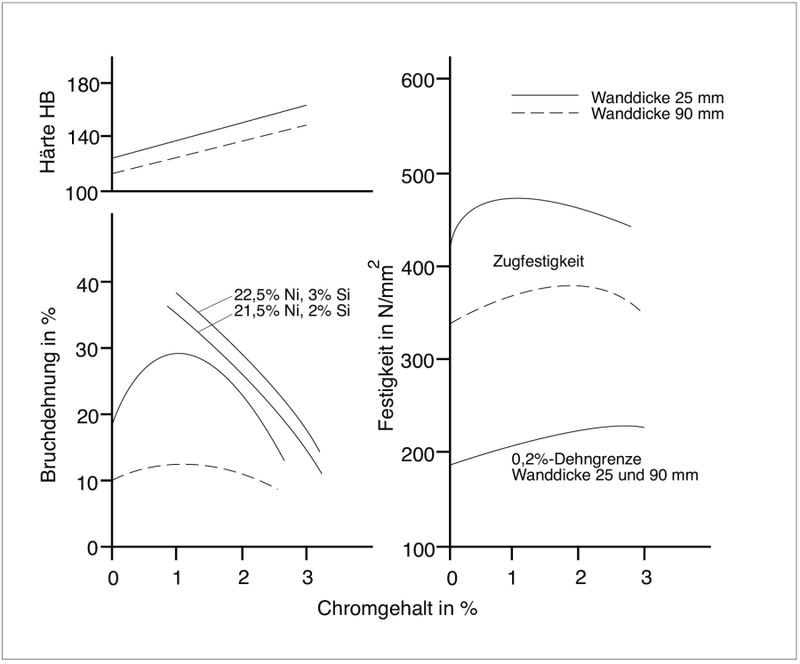 With reduced chromium content, machining properties are increased. 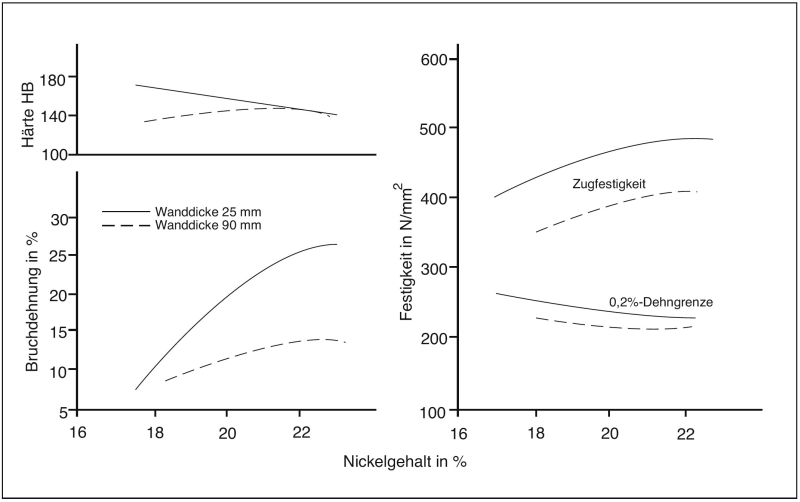 Figure 5 and 6 show examples of mechanical properties depending on the respective chromium and nickel contents. Types of austenitic cast iron with a non-magnetizable matrix become increasingly magnetic with chromium contents above 2.5 %, since the discharged carbides with high chromium contents are ferromagnetic. 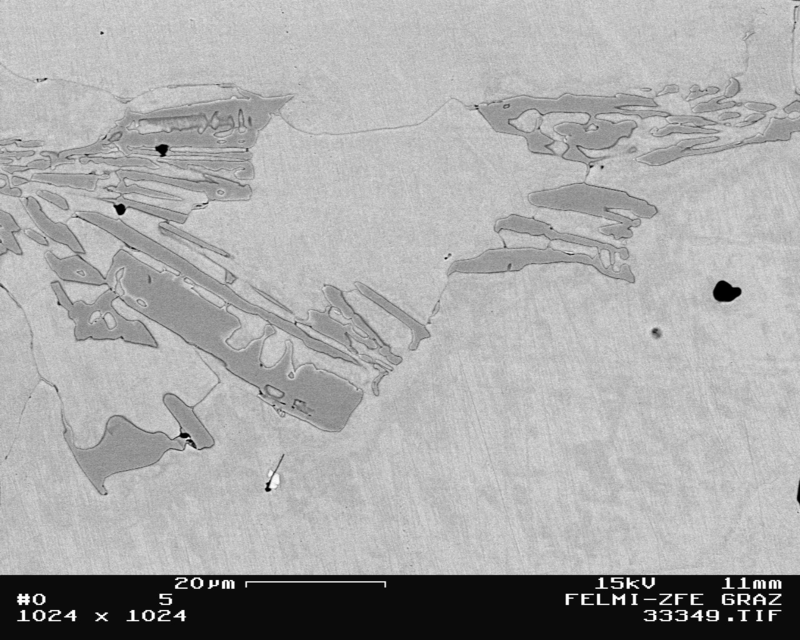 Non-magnetic alloys become ferromagnetic with nickel contents above 25 %. Molybdenum is not a defined element but addition of 1 % Mo to austenitic nodular graphite cast iron improves high-temperature tensile strength with only slight reduction of ductility. Ultimate strength and creep strength are positively influenced by addition of molybdenum.